As you'd expect from one of Apple's consumer apps, iWeb is very easy to use and requires no knowledge of HTML or any other technologies. Starting with one of Apple's attractive page templates, you build up your web page by replacing elements in the template with your own text, images and multimedia files. It's a good approach for beginners, since it means you're almost guaranteed an attractive web page by the end of your work. Site management is equally easy, with iWeb automatically adding and maintaining hyperlinks where appropriate. For those who need something more, there is some degree of customisation available. You can drag elements around the page, getting them to overlap and cover others. You can style text in almost any way you like and iWeb will work out what combination of HTML, CSS and graphics are needed to replicate the look you've created. iWeb integrates with other Apple technologies very well. There's the standard iLife media browser for accessing your photos, videos and audio tracks. There's also built-in support for publishing to your .Mac web space. 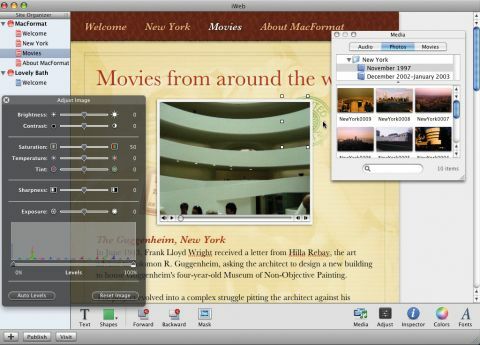 True to form, iWeb has support for the latest blogging, podcasting and videocasting technologies, such as those built into other iLife apps.